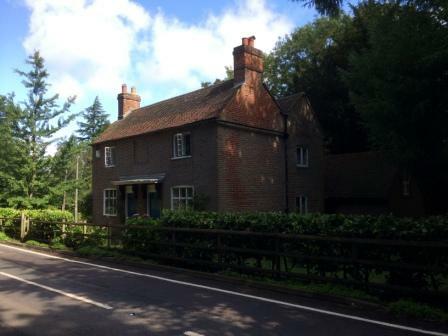 Red brick with projecting courses to eaves; Two story with hipped tiled roof and casement windows; Two entrance doors with flat hoods supported on ornate wooden brackets, probably re-used from elsewhere. The house was originally two, two story timber framed semidetached cottages with large, high ceiling rooms on the ground to the front of the house and is single story to the rear. Two cellars mirror the two front rooms. Spiral staircases at each end of the building, enclosed in cupboard like enclosures, go from the cellars to the first floor. At some time the two cottages were converted into a single dwelling, possibly during the 1970s. A 2nd story was added to the rear of the house in Victorian times. This is alteration can be seen as the double pitched roof with a central gutter (see above). The current owners moved into the house during the 1980s and had a sympathetic single story extension built at the back of the house. 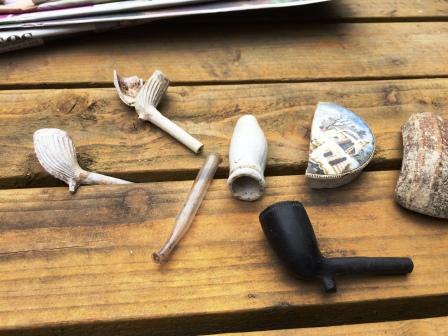 In the garden at the rear of the house they discovered a midden containing a large quantity of bottles, pottery shards and clay pipes. 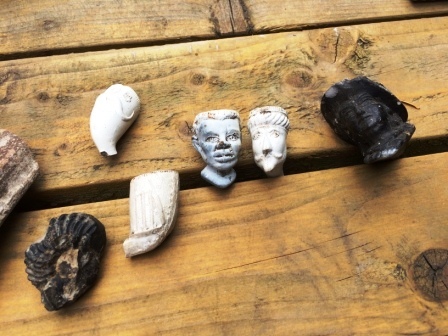 Included among the clay pipes were a number of splendid examples of pipes with decorative bowls (see below). Among the pipes were two black examples. 2These pipes are not made of a ‘black clay’, but an ordinary white clay that has been fired in a reducing atmosphere. The pipemakers used to do this by sealing them in saggers (a ceramic boxlike container) with sawdust, which burnt up all the available oxygen, resulting in a black colour. They are not particularly common, but the technique was used occasionally, especially during the late 19th and early 20th centuries. A geophysical survey (resistance) was conducted of the garden to the side of the house without any features of interest being found. KCC Heritage record – TQR 66 NE 161. This entry was posted in Research and tagged Cobham Landscape Detectives, cobham village. Bookmark the permalink.